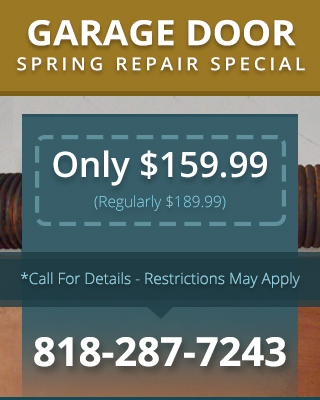 The goal of your garage door maintenance in Las Virgenes CA should be to correct current problems and prevent future ones. For example, we can identify parts that may need tightening, which will not only cure problems like noisy doors or underpowered springs, but also potentially help prevent other problems from developing. When all the parts on the door opener system are tight, there’s less chance of the door falling out of alignment and damaging the tracks or rollers in the process. While small adjustments and repairs will be done automatically as part of the maintenance package, larger repairs or major parts replacements will not be done without your consent. We are strong believers in safety here at Carroll Garage Doors both for our employees and for your family. Though virtually every garage door opener system comes with safety mechanisms, these mechanisms need maintenance in order to stay effective. Reversing mechanisms can get over-sensitive, preventing you from shutting the door, or photo eye sensors can burn out, leaving you vulnerable to an accident Even if you aren’t experiencing any problems with your garage door safety features, you should definitely invest in garage door maintenance in Las Virgenes CA for a better safe than sorry approach. Because our technicians are experienced with all kinds of garage doors and opener systems, we can provide whatever kind of maintenance you may need.